The exploration of wearable and mobile technologies for creating tools to support the examination of habit, self-awareness and quality of experience. The application of these tools aims to enhance physical and psychological functioning and well-being. The design and exploration of interactive objects, surfaces and spaces to encourage physical activity, informed by knowledge from dance and somatic practices which value creativity, exploration, imagination and the pleasurable qualities of movement. The goal is to create opportunities for creative physical engagement beyond exercise. Integrating a Somatic Approach in User Experience Design of Wearable Technologies (with Thecla Schiphorst) - funded by the International Program Development Fund, University of Sydney, 2015. Creative Strategies for Physical Health Activity - seed funding from the PLANET network and the Faculty of Architecture, Design and Planning, University of Sydney. Three key challenges for sustainable living point to a pressing need for rethinking how the designed environment can better support physical health and well-being. Statistics show that increasing life expectancy has resulted in an ageing population crisis, with associated issues of health, work and housing. In parallel, the continual increase in the computerisation of work and leisure has led to a minimisation of physical activity. These converging trends signal a rise in sedentary existences, with significant health implications in the physical, mental and social dimensions. There have been a number of recent initiatives around the world exploring technology-mediated approaches to playful, physical activity and encouraging people to be more physically active for maintaining health and well-being (for example, the Piano Stairs by Volkswagen). Our research contributes to this vital area of concern by investigating the potential of sound-generating, interactive surfaces for encouraging physical activity and creating opportunities for creative physical engagement beyond exercise. The family of configurable interactive surfaces can be deployed in a range of settings, such as hallways and staircases, turning transitional spaces into creative playgrounds. Key to the research inquiry is the development of a programmable interface for the system enabling new sounds and sensor-sound mappings to be added and manipulated through user-specific movement characteristics and patterns. This interface will be used to test various combinations of sensors, sounds, and alterations in sound parameters (e.g. velocity, accent, attack, volume) and the resultant influence on user engagement with the system. A working prototype is planned for late 2014, ready for user testing in 2015. 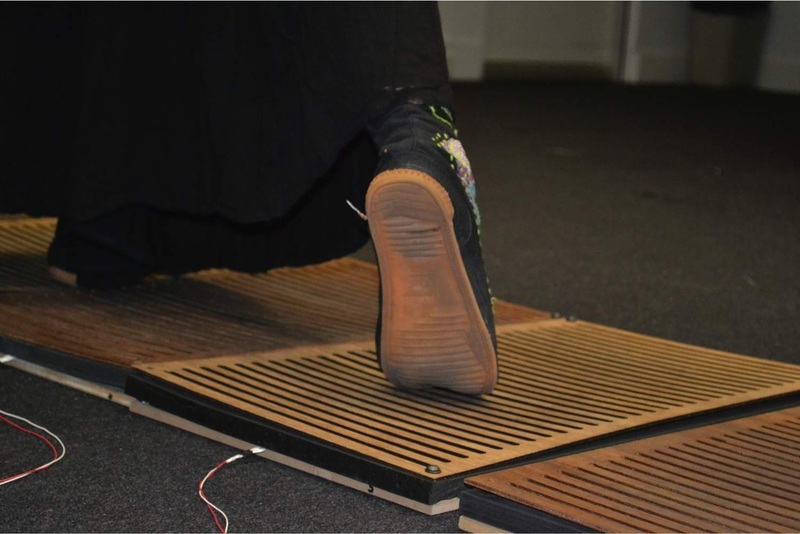 The version 1.0 prototype consists of a pressure-sensitive surface, with a responsive sound generated when people walk on the surface. The surface can be overlaid on existing stairs. In Stage 1 of the project, additional sensor capability will be added, such as wearable motion and camera-based motion tracking. The programmable interface to change the sound response and sensor-sound mappings will be developed. In Stage 2 the full comparative study will be conducted. It will require a robust functioning version of the system, able to be installed in a working staircase. This version displays greater sensitivity to the changes in pressure as a person moves and shifts their weight. The sound engine is built using Ableton Live and Max for Live. This enables all kinds of sensor to sound mappings and a wide diversity of sounds to be generated. We have invited Butoh dancers and Feldenkrais practitioners to help us design and evaluate the prototype Slow Floor. Preliminary results from the Slow Floor study have indicated the potential of sound textures to generate imaginary spaces and qualities that invoke a change in user’s movement patterns and an increased attentiveness to the mechanics and experiential quality of the movement (mediated by sound) - what we are terming ‘creative agency’ (Feltham, Loke et al., 2014). Feltham, F. and Loke, L. (2012) The Slow Floor: towards an awareness of bodily movement through interactive walking surfaces. In Proc. the 2nd International Body In Design workshop, OZCHI 2012. Prototype musical staircase developed by Frank Feltham (RMIT) for City of Melbourne, 2010.